Gov’t inventory of OFW cases sought. Recall case issue: Mary Jane Veloso case of drug trafficking facing death at Wirogunan Prison Facility in Yogyakarta, Indonesia. Representing counsel: court-appointed pro-bono counsel. 21 October 2010: the Philippine Embassy in Jakarta hired a private counsel to assist her in her appeal. “I am informed that Ms. Veloso’s story is not isolated and has evolved to be a very disturbing pattern,” Pacquiao, the vice chairman of the OFW committee, said. VP Binay appeals to Qatar gov’t to investigate on OFW coercion issue. 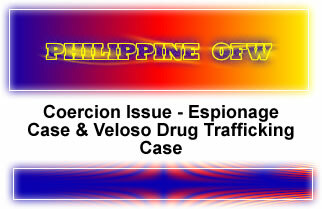 Case Issue: 3 OFWs; all with espionage case.